Over The Counter (OTC): Over the counter drugs do not require a veterinarian's prescription when used exactly according to the manufacturers label. These medications have been determined to be safe and effective for use without supervision of a veterinarian. Prescription (Rx): Drugs that have special safety concerns related to animal, administrator, or food safety are approved as prescription drugs. These are required to have a warning statement on the label of "Caution: Federal law restricts this drug to use by or on the order of a licensed veterinarian"
Extra Label Drug Use (ELDU): Either OTC or Rx drugs used differently than described on the manufacturer's label is considered extra label use. ELDU can only be performed under the supervision of a veterinarian who will apply their own label to the medication. Veterinary Feed Directive (VFD): Prescription only medicated feed. Must be used according to the labeled directions. Whether OTC, Rx, ELDU, or VFD, the drug label includes necessary details that allows the drug to be safely used and protect the human food chain from drug residues. This information may be applied on the label by the manufacturer or attached by the veterinarian. 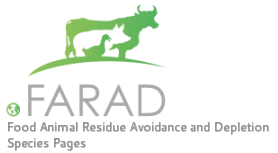 * In situations where extra label use of a medication needs to be sent home with a client prior to the veterinarian receiving an estimated withdrawal interval, FARAD recommends providing an INTERIM extended withdrawal interval of at least 90 days* for meat, eggs, and milk, with the caveat that the withdrawal interval will be updated after receiving a response from FARAD. A watermark or some identifying marking for the label with the INTERIM extended withdrawal interval is also recommended. We further recommend that the UPDATED withdrawal interval be documented in the medical record and shared with the client in some form of writing. Exception is for aminoglycoside antibiotics administered via any route with the potential for systemic absorption, in which case a withdrawal interval of 18 months is recommended. Please note that there are specific labeling requirements in 21 CFR 530 that must be followed when prescribing drugs in an extralabel manner. We have provided a screen shot (below) listing the specifics for labeling of drugs prescribed for extra label use. In addition, you can view 21 CFR 530 for additional information.